If you haven’t read this book to your kid by now, you must not live in America. It’s just a classic in my neck of the woods. And the best/worst part is that the book is a sort of sing-a-long. You can just read it, obviously, but once you’ve heard it sung aloud by the Storytime leader, you’ll never be able to just read it again. At least not in my experience. Anyway, I took Tuesday off work because my husband had a day full of prep meetings for the beginning of the new school year. And Tuesday is Storytime day! I haven’t been able to take Gibson to Storytime since I started back to work in June. I was so excited to spend the day with my little man, doing the things we used to do together when he was a newborn. Of course, 45 minutes before Storytime was to begin, we were both naked and crying in the living room. But no matter, we managed to get our act together despite our skipped nap. When he saw we were at the library, Gibson perked right up. He only got upset during the shakey egg chicken song. But that was just a bit of over-stimulation, I think. It struck me completely by surprise to find myself crying over this book. But it wasn’t really the book so much. It was the fact that I don’t get to take Gibson to Storytime anymore. That mom taking her son to mid-week book reading with a group only happens on special occasions now. Like The Man having to work off schedule. I couldn’t finish the song because I was trying to control myself. But tears slipped out anyway into Gibson’s tufty blonde/brown hair- so much thicker than when he was first born. His little chubby cheeks were aglow in delight as Ms. Phyllis finished the book up, using ASL to sign the last words to the group. I tried to be discreet as I wiped away my tears. No one said anything, so I think I was successful. In so many ways, I have it all. A beautiful baby, a handsome, employed husband, my own job, a house that isn’t falling down, two cars that work, etc. But taking Gibson to Storytime, I realized that no matter how much I have…I’ll always want more when it comes to my son. More time mostly. Stretching out Storytime and bath time and play time and tummy time. I’ll always want more giggles and smiles. More glimpses of those dimples that only appear when Gibs grins. More quiet nursing time when our eyes connect. More time to watch him sleep. Watch him learn. Watch him grow. Now that I’ve gotten Gibson’s swing repaired, he’s completely outgrown it! I mentioned to a friend and fellow parent that Gibs looked like a member of the lollipop guild when I placed him in the cradle of the swing yesterday. Like a toddler practically. My friend just said, “You blinked, didn’t you?” I did. I must have. In the two weeks the swing was in disrepair, my son decided he would just hulk out and grow, apparently. It happens so quickly, but so gradually at the same time. I mean, the signs were there. I had to go up a size in all of Gibs diapers last week. There I was struggling to make the snaps meet where they had always previously met easily before. And I finally realized, um- this kid needs his diaper sized up. Thankfully, it’s a matter of just changing the snap placement in our one size pocket diapers. 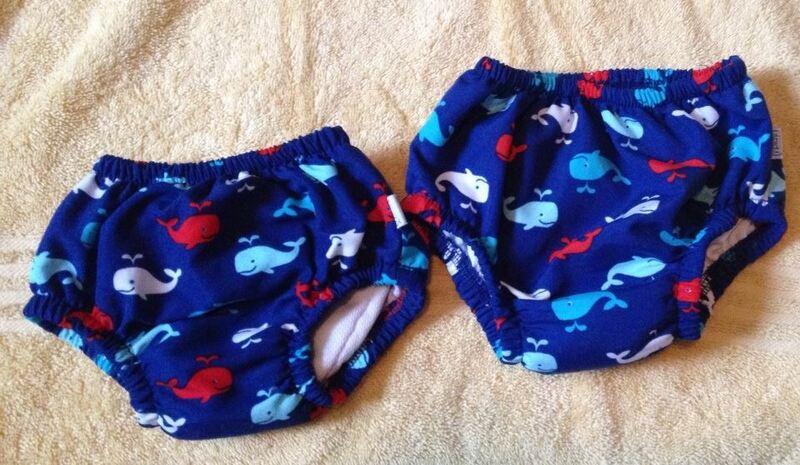 And I had to buy new swim diapers in large for the kid. Forget medium-size! Straight from small to large! I also bought new pre-folds in size large as well. Give a kid some squash and all the sudden, he starts growing faster than you can notice. Geez! Small swim trunks next to large size. Anyway, I’ve got one more purchase to make. I’m buying that damn book. Maybe I can’t take Gibs to Storytime every week. But I can keep the book at home and sing that song with him. It’ll always be the activity we started together, but that continues with his father weekly. And I do get to have Gibs to myself on Sundays with swim class. So that’s something. Still…..*sigh* I’m greedy and want that kid with me as much as possible. I suppose it’s only natural.